Submitted by the Spartans: Spartans had their first two major open houses before and after Thanksgiving with more than 200 new interested students. The corps hall was busting at the seams with parents that showed up to see what the drum corps activity is all about. After an initial Power Point presentation to all in attendance, the parents were whisked away on the Spartans' charter buses to give them a glimpse of Nashua, N.H., and facilities that the corps uses for practice during the course of the season. While away, all new members got to meet the instructional staff and actually participate in a mini practice session. Toward the end of the day, all sections were given the chance to perform short practice pieces and techniques to all in attendance. "With such an increase in this year's early numbers, the corps may be looking at a slightly larger corps than in the past," said Spartans Executive Director Peter LaFlamme. "Our plans for making the trip this August to Pasadena, Calif., for the 2007 DCI World Championships may have something to do with that!" Find more information about Spartans' auditions at www.spartansdbc.org. Submitted by Jersey Surf: A very strong turnout of returning members and new prospects helped to launch the 17th season for the Jersey Surf, which held its highly successful first rehearsal weekend of the 2007 season over the Thanksgiving holiday at the Camden County Technical School in Berlin, N.J.
Unseasonable New Jersey weather allowed Jersey Surf members to work outside during their Thanksgiving audition weekend. "With more than 70 returning members of the 2006 corps present this weekend, combined with a tremendous response from prospective new members, we couldn't be happier with the start of our 2007 season," said Brian Prato, Director of Operations for the corps. "We've enjoyed large showings for the first camp over each of the past several years, but it's obvious that the size of this year's group, combined with the maturity and the levels of preparation and experience displayed by the young men and women in attendance this past weekend signal a turning point in our evolution as an organization. "The fantastic, spring-like weather with temperatures near 70 degrees enabled us to move outdoors for some of our rehearsal sessions on Saturday afternoon, providing us with an opportunity to give the prospective members a preview of things to come. They responded wonderfully, and we're already looking forward to our second camp, to be held over the weekend of Dec. 15-17," added Prato. The December camp will serve as the Surf's final "audition weekend" for the 2007 season. 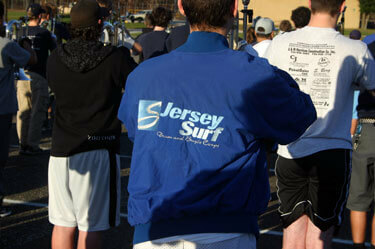 Find more information about Jersey Surf's auditions at www.jerseysurf.org.